Many health professionals advocate the use of Cold Press Juice to assist in the fight against diseases, including cancer. For example, Gerson Therapy has been advocating juicing since the 1930s. Fruits and vegetables naturally contain vitamins, minerals, antioxidants and plant compounds that protect against disease. Juicing is the quickest and most powerful way to increase your intake of these essential nutrients. For financial reasons, synthetic patentable medicines attract the vast majority of research investment, not natural medicine. As a result stories of miraculous cures continue to be anecdotal. Nevertheless, numerous studies that have been done on the effects of juicing are supportive of its health-giving actions. Cruciferous vegetable (cabbage, broccoli, cauliflower), allium vegetables (onions, garlic, scallions, etc) and dark berries have been shown to be powerful anti-cancer agents. Cruciferous vegetables for example contain nutrients that block the growth of cancer cells. prevent metastasis (cancer proliferation throughout the body) and can even make cancers cells pop or die. This large study found significant reductions in Alzheimer’s for those who drink fruit and vegetable juices three or more times per week, compared with those who drank juices less than once per week. High levels of polyphenols antioxidants in juices are believed to protect brain cells. A recent study of vitally important microbiome (gut flora) shows that juice fasting encourages the balance of microflora. 95% of the body’s DNA is derived from this bacteria. It is becoming clear that the balance of your bowel is extremely important. For example, Firmicutes bacteria are suspected to be encouraging obesity and weight gain. Conversely, Bacteroidetes are linked to a leaner body composition. Juice fasting was found to significantly decrease Firmicutes and increase Bacteroidetesbacteria. Fruit and vegetable juices exhibit high antioxidant activity due to their diverse phenolic compounds (healthy antioxidants that protect against aging for example). A three-day juice fast resulted in up to four pounds weight loss.Two weeks after the cleanse, about 50% of this weight loss was retained. Blood plasma NO levels decrease during juice fasts. Meaning increased blood flow and place less stress on your heart. Juicing brings a significant decrease in lipid peroxidation, meaning a reduction in cell damage leading to aging. Apple and pomegranate juices have been linked to reduced blood pressure and cholesterol levels again pointing to reductions in heart disease. Juice drinkers had lower intakes added sugar and consumed significantly more whole fruit than non-consumers. No difference was found in total fiber intake. 100% fruit juice does not lead to weight gain in children. Children consuming 100% juice had higher intake and adequacy of dietary fiber, vitamin C, magnesium and potassium. No association was found between drinking 100% juice and early dental caries in nearly 2,300 American children ages 1-5 years. Indeed juice seems to have a protective effect against caries. Juicing provides levels of nutrients equivalent to whole foods. When 100% juice was replaced with whole fruit in the diet of children, no difference was found in caloric levels or in the intake of 85% of the nutrients evaluated. Numerous cure and prevention health systems around the world employ juicing to combat serious degenerative diseases. 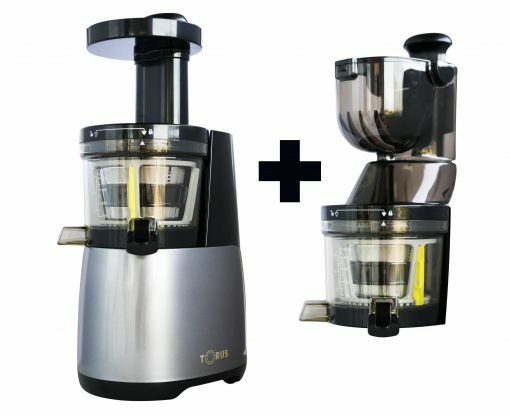 Juicing protocols can easily be replicated at home with Torus Cold Press Juicers, replacing nutrient-dense for nutrient-poor (or worse sugar or saccharine based) drinks. Introduce healthy habits, fuel your body with vital organic food – experience the vibrancy of raw health by unlocking the health-giving effects of the entire vegetable and fruit world to delicious effect. Improved hopper and auger design to maximise cold press efficiency and increase crushing action, producing higher yields and less pulp. The first Torus machines came to Australia in 2015. Our mission statement was to supply the highest quality juicers at the best price and we continue to dedicate ourselves to that. Rather than offering a confusing array of juicers, we have selected the two machines that we believe combine performance, durability and a choice of affordability alongside professional juice quality to suit the needs of every kind of user. 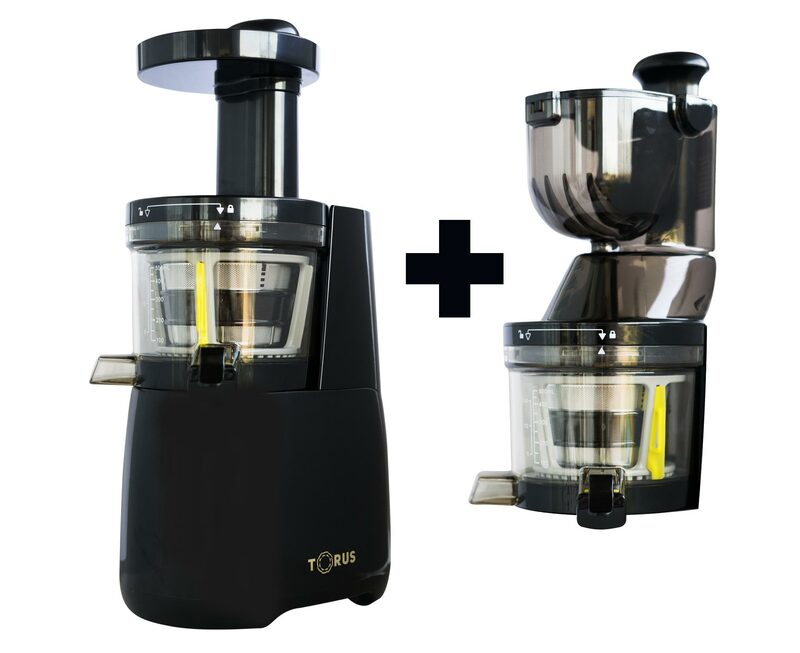 Torus slow juicers harness the latest cold press / slow juicing technology to release the nutritious energy of fruits and vegetables into delicious drinks full of raw power. Over the last four years, Torus have tested the best slow juicing machines available and are proud to introduce our 2 top picks from two of the most established slow juicer manufacturers under the Torus brand. 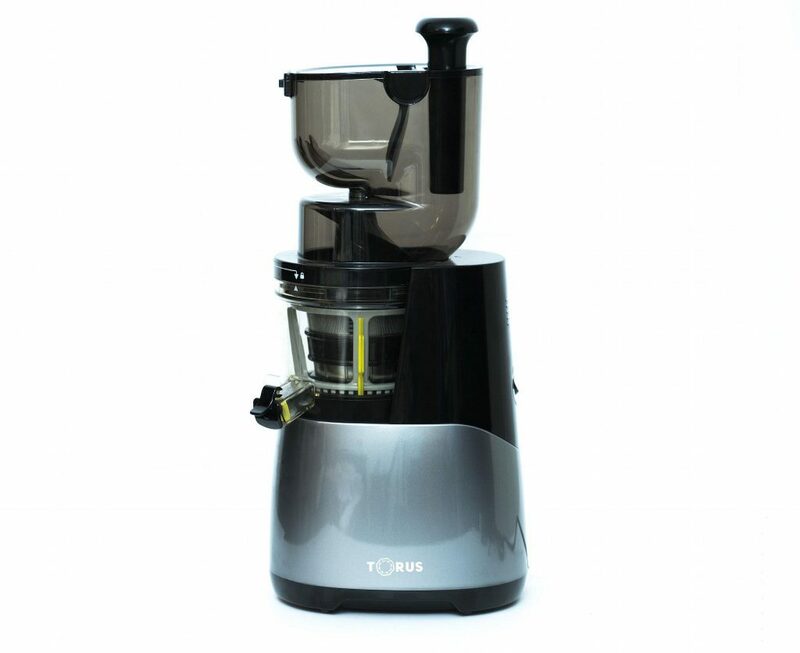 You can depend on Torus slow juicers to offer the best range of quality machines available at competitive prices. Just released, Generation 2 of our top of the line Wholefood Torus 5000 juicer features a new improved auger and a more ergonomic bigmouth hopper system. Torus juicers embody the latest cold crush technology, releasing pure, delicious, colour-rich nutrition, straight from the bounty of the planet to your lips. By powerfully squeezing your ingredients rather than blending them, Torus Cold Press Juicers deliver the smoothest, professional tasting, juices, while preserving the natural taste and nutrition of each ingredient. Imagination is the only limit: Torus Cold Press Juicers have the versatility to create endless delicious recipes ranging from wholesome green juices and wheat grasses to nut milk and sorbet – download our free recipe book for selected tasty recipes and juicing tips to help you get the most out of your Torus Cold Press Juicer. At the forefront of the Australian Cold Press Juicers revolution, Torus uses the latest extraction method to provide maximum nutrition and minimal separation in your juice: In addition Torus Cold Press Juicers make smoothies, tofu, nut milk and ice cream. Torus Cold Press Juicers Australia is proud to deliver the many benefits state-of-the-art Cold Press Juicing offer to the modern household. 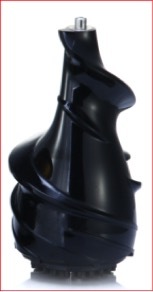 The Torus blunt edged auger and powerful AC motor is heat-free backed with an 8-year warranty on the motor, with a 2-year warranty on other parts. A full range of spare parts is available from our online store. We provide top industry aftersales support. See our Warranty page for more information. 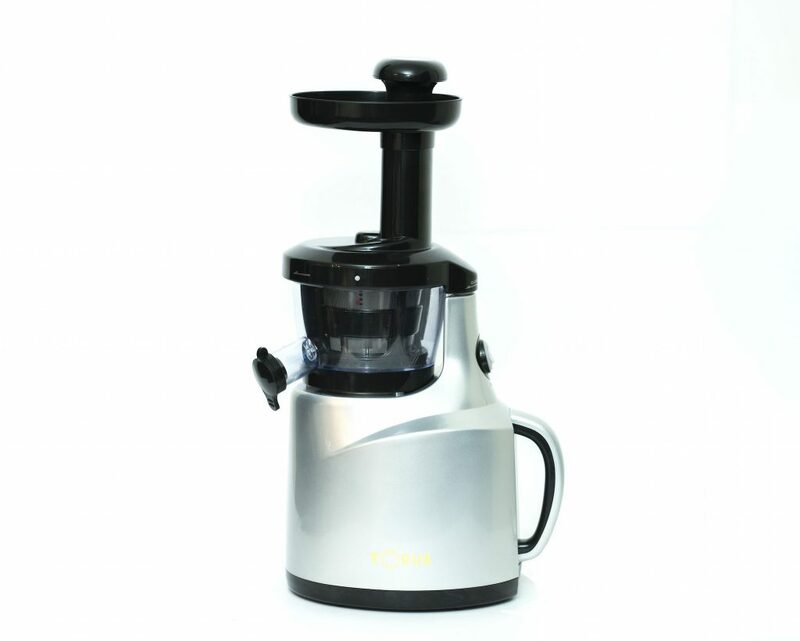 Unlike high-speed juicers Torus Cold Press Juicers run quietly, with low noise and vibration, eliminating heat and friction that can result in juice separation. The high yield Torus Cold Press Auger maximizes juice production while minimising wastage and pulp. Complete Big Mouth hopper assembly, auger, bowl, etc. 1) Warranty is automatically registered on purchase. 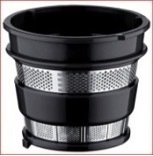 2) If you want a fine juice with no froth or fibre traces, use provided sieve insert in your juice jug. Ultra juice extraction and polishing can be achieved by squeezing pulp through the nut milk bag provided. 3) Strainers and Tofu Box. For smooth feed through and to prevent binding, cut fibrous vegetables (celery, kale etc) into 1 cm lengths. Soak nuts overnight, rinse and drain well. Set up your Torus with the fine juice sieve and the spout cap closed. Using a ratio of 1 cup soaked nuts to 3 cups of water, feed through the juicer alternating nuts and water. Release spout cap halfway to harvest the milk, then close and continue until all the water and nuts have been added. You may then feed through the pulp a second time with an additional cup of water if desired. Refrigerate milk in glass container and use within 2 – 3 days. Remaining nut pulp can be used as nut flour in cakes, pancakes, etc. Use immediately or freeze until desired. Freeze fruit of your choice in 3 cm pieces (bananas, berries, mango etc). Defrost for ten minutes. 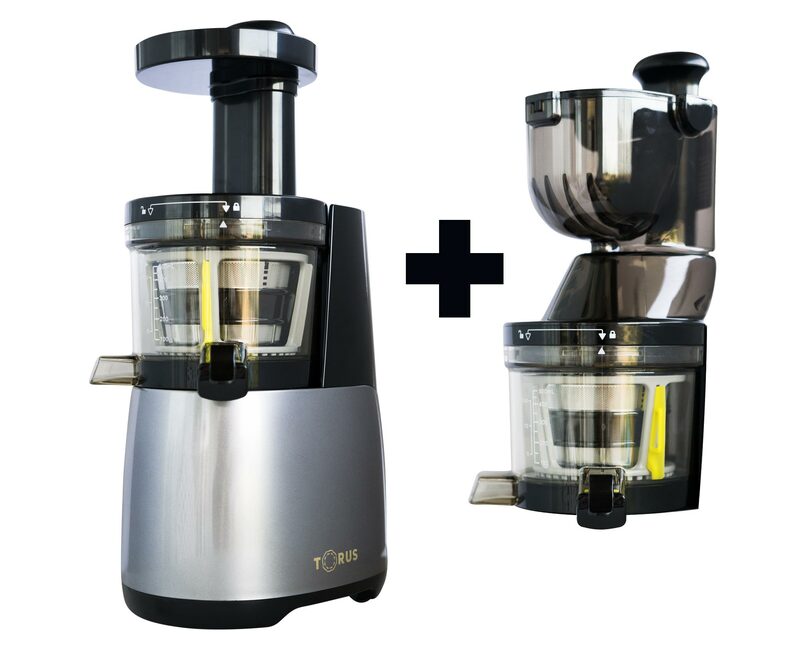 Run through the juicer using the blank strainer to create mouth wateringly delicious, healthy, sugar-free ice creams. Set up your Torus with blank sieve. Mix together 1 cup of almonds, 1 cup of desiccated coconut and 1 cup of dates, and gradually feed through the Torus a few at a time. You will get a sticky paste that is ready to be rolled into bliss balls. Add flavours of your choice (vanilla, cocoa powder, orange essential oil etc) before rolling and set in the fridge. Set up your Torus with blank sieve, Feed through 2 cups of cashews and 1 cup of sunflower seeds one tbsp. at a time (if auger gets stuck at any time use the reverse button for a few seconds before proceeding). Once collected, feed through a second time for smoother finish. In a large bowl mix the nut paste with ½ cup filtered water, 1 tsp sea salt, ½ clove minced garlic and a tbsp. of sauerkraut juice to provide probiotic bacteria (you can also use a tbsp live nut cheese bought at a store or from a previous homemade batch). Stir until smooth, adding more water if needed one tsp at a time. Transfer the paste to a nut milk bag place inside a tofu box, pressing down the lid firmly. Leave at room temperature for 6 – 8 hours, then remove nut milk bag and keep in the fridge in a clean glass jar. If not consuming your cheese within 24 hours, a covering of olive oil will extend the life up to a week. Experiment with other nuts and seeds like almond, walnut, pumpkin and try adding other flavours like fresh herbs, spices, olives, sun dried tomatoes etc. A. Soak soybeans in water for at least 8 hrs or until you no longer see wrinkles on the beans. Do not leave during hot weather for more than a day. B. Pour away soak water and rinse. Pour soybeans and the 1 litre of water into the running Torus juicer. Use all of the soybeans and water. The water will prevent clogging and give better results. C. Soy pulp will eject simultaneously with the soy milk. Once done, you will get approximately 2 containers of the soy milk when done extracting. D. Optional: Extracted soy milk can be put back into the juicer for re-filtering to achieve finer and smoother soy milk, which will create softer tofu (if desired). Without re-filtering, you will end up with coarser and more firm tofu. E. Place soy milk in a saucepan on high and stir constantly to prevent sticking. F. Mix the vinegar and ground sea salt together in a small bowl. G. As soon as the soy milk boils, lower the heat and add the salt/vinegar mixture. H. Stir only 2-3 times very slowly on medium heat and let the soy milk curdle (create lumps). I. Remove from heat once the mixture has curdled sufficiently. At this point, it will have become soft bean curd. J. Place the bottom of the Torus Tofu Box inside a large bowl making sure there is enough room for water to drain out. Line with cheesecloth. Scoop soft bean curd into the lined pan. K. After wrapping the cheesecloth evenly over the bean curd, place the lid on top. 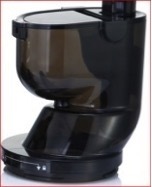 Place the squeezing screw (Auger) from the Torus juicer on top of the tofu press. In approximately 30 minutes, homemade tofu will be ready and ready for use or refrigeration. After you have finished juicing run warm water with a couple of drops of washing up liquid through it. Then soak components in warm water with a little washing up liquid. You may need to remove the yellow pulp stopper. The back of the brush provided can be used to clean the pulp chute. Rinse and dry. Don’t forget to replace the stopper. Some big hard seeds such as large size lemon pips are indestructible and can damage the sieve.